Got £44,000 burning a hole in your pocket? The Everest DD66000 is JBL's ultimate state-of-the-art hi-fi loudspeaker, a magnificently massive monumental affair that effectively doubles up the already dramatic K2s. Indeed, if asked to nominate my all-time favourite among the thousand or so speaker systems that i've tried over the past twenty something years, I'd definitely pick the Everest's predecessor, the JBL K2 S9800. I was, therefore, unlikely to say no when asked whether i'd like to review a pair of DD66000s for the christmas holiday. A quick Google, however, indicated some inevitable practical problems. This 'flagship' model is not only very expensive, it's also extremely heavy. Weight aside, it's also exceptionally large, though not unduly tall, while the front-to-back depth is surprisingly small. It's also quite beautifully styled, in the way the large midrange horn is integrated into the front and in the classy veneered bass enclosure that forms a continuous curve around the sides and back. The result is very elegant and not unlike a large and beautifully made item of furniture. Construction is complex throughout to combat any possible colorations. Nostalgia plays a part in an unusual shape, which harks back to the very successful 1950s Hartsfield corner horn design. This really put JBL on the Japanese audiophile map and Japan remains the major market for JBL's high-end Project designs. A more prosaic and fundamental reason for this speaker's width lies in a driver line up that places two 380- millimetre bass drive units side by side across the front. These sit below a wide, but vertically quite narrow midrange horn (giving 100- degree by 60-degree directivity), which in turn sits below a tiny horn-loaded supertweeter (60-degree by 30-degree directivity). That unusual collection of drivers and their disposition certainly doesn't conform to any current US 'high end' stereotype, but to JBL's history, which goes back to the 1920s. It's successful across every possible speaker category and has learned a thing or two along the way. 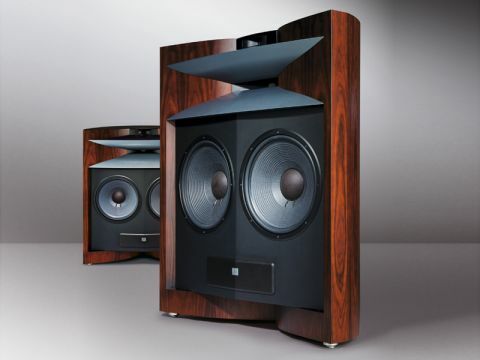 This Everest DD66000 might be large, heavy, very costly and decidedly different, but all aspects of Greg Timbers' acoustic design have undeniable logic, and industrial designer Daniel Ashcraft has also done a very neat job from a difficult brief. This is at heart a two-way design, albeit "augmented" (as JBL puts it) with some extra help at both ends of the audio spectrum. The crossover points listed in the specifications explain how it operates. The main crossover point, set at 700hz, transfers the signal from the inside 380-millimetre bass/mid driver to the horn-loaded 100-millimetre mid/treble compression driver. The other (outside) 380-millimetre unit only operates up to 150hz, albeit with a relatively gentle six decibel/octave roll-off above that point. The 25-millimetre compression horn 'supertweeter' only comes in (and at a rapid 24-decibel/octave rate) at 20khz – effectively above audibility. Whatever one's views about horn-loaded compression drivers, which are certainly regarded with some suspicion by some sectors of the hi-fi industry, using one allows JBL to place that major crossover point down at 700hz. That's some two octaves below the 2.5-3khz frequency used by the vast majority of conventional two-way direct radiator designs and a far better frequency for delivering properly coherent voice reproduction. Using two 380-millimetre drivers to supply the bass for a domestic hi-fi system might seem over the top. But, having enjoyed the single example used in the K2 S9800, i too was nervous that this Everest would deliver altogether too much bottom end. There was some excess to be sure, but not sufficient to be distracting, and thinking it through, such a large bass driver area actually makes plenty of sense. After all, the larger the area of the cones, the less the excursion required for the same loudness and the more closely it resembles the behaviour of a musical instrument. Indeed, in some respects the bass driver area here has something in common with that supplied by horn-loaded bass, which has got to be a good thing. The sheer quantity of information in the Project Everest DD66000 Technical White Paper is rather overwhelming, with far more detail than we have space to cover properly. Heavily edited highlights include very advanced drive units. Both horn-loaded units use beryllium dome diaphragms, 100 millimetre and 25 millimetre in diameter, while the 380 millimetre bass drivers have 320 millimetre diameter doped paper cones with concentric ring stiffening, and a complex motor with an Alnico magnet. Uniquely, the crossover network uses two nine volt batteries to polarise key capacitors and improve their linearity. The horn enclosures are largely made from precision moulded SonoGlass, with a measure of mechanical isolation from the main enclosure. The main carcase is made from different thicknesses of MDF, totalling 25 millimetres and with extensive bracing, while an extra leather-covered layer takes the front baffles up to 45 millimetres. The speakers were positioned with normal left/right separation and as far from the rear wall as possible without blocking the doorway. Although a little closer to the wall than might have been desirable, I doubt it was much of a compromise, and the weight and bulk rendered further exploration impossible. There was a bit too much bass when measured under our usual far-field, in-room averaged conditions, but around six decibels below 250Hz didn't seem too excessive. However, what was totally impressive was the remarkably flat and even tonal balance further up: the response from 300Hz all the way up to 10kHz was held within remarkably tight +/-1.5 decibel limits. The ultimate top end roll-off was mildly marred by a small 17kHz spike. Not unexpectedly, sensitivity is generous, especially below 300Hz, if not quite as high as the specified 96 decibels above 300Hz. Furthermore, it's achieved alongside a fairly easy amplifier load, which stays between six and eight ohms over most of the range, only falling below five ohms at ultrasonic frequencies. The pair match was very close indeed and the ports are tuned to a relatively low 28Hz, ensuring good response down to 20Hz (at 92 decibel sensitivity under our in-room conditions). The truly marvellous feature of this extraordinary speaker is its utterly magnificent headroom. There's no stress or strain at any level and if you start winding up the volume, it's pretty certain your ears or your amplifier will give up long before the Everests do. In fact, until this degree of headroom is actually experienced, it's hard to believe it makes much difference, but believe me it does. Tied in with this headroom is quite brilliant overall consistency. Play it whisper quiet so you don't disturb the household in the middle of the night and you still hear everything that's going on, albeit quietly. Turn it up as loud as you can, to near disco levels, and every note is clear as crystal. The JBL doesn't mind. It'll simply do its thing with impeccably smooth neutrality, and wonderfully coherent voices. The overall character might err on the bright side for some tastes and systems and its openness is not kind to poor quality signals. Top quality amps and sources are essential here, even if the trim control helps a little. But the Everest's best feature for my money was the way it handled the bass guitar. This instrument is the foundation of truly great rock music and I've never heard a speaker deliver bass lines with better poise and delicacy as well as power. Strong but not heavy or intrusive, they're also exceptionally clean and subtle. I dug out most of my Grateful Dead discs, simply because Phil Lesh's bass playing was so engrossing, and took similar pleasure with recordings featuring Jack Bruce, Jaco Pastorius, John Entwhistle and Jack Cassidy. Massive Attack's Mezzanine did sound rather too bass heavy, but conversely Mingus Ah Um seemed somewhat bass light, so one can hardly blame either on the speaker. Coloration is exceedingly low, dynamic range is wide, dynamic expression is always vivid, while the speakers proved surprisingly involving and informative when handling notoriously 'difficult' material like early Velvet Underground and Captain Beefheart recordings. Horns do it differently, especially in imaging terms. They treat sound a little like lenses do light, focusing it into a beam. This reduces the proportion of room reflected sound in the total sound compared to conventional direct radiator designs. The result is remarkably sharp, precise and well focused images, giving great insight into the recording itself, but less of an illusion of musicians coming into the room. Delivery and installation coincided with Rage Against the Machine's brilliant Killing in the Name download making the coveted christmas Number one slot. I celebrated by digging out my eponymous 1992 LP and using it to 'break in' the Everests. Although my regular Naim NAP500's 150 watt falls somewhat short of the everest's stated 500 watt power handling, it still generated unfeasibly high levels, to the point where the the listening room windows started rattling while the JBLs showed no signs of stress whatsoever. High sound levels come naturally to the Everests. They just go on getting louder without complaint or compression, make a great speaker for those into heavy dance/techno music and will go seriously loud without ever tending to sound aggressive. The massive headroom and lack of strain is always very welcome. The generous sensitivity means that low noise amplifiers are preferable – some faint hiss became audible via the Naim amplifier when the world became after-midnight quiet, though not sufficient to spoil things. However, despite what JBL says, very low power valve amplifiers are also entirely practical. The manual (with, one detects, a slightly sniffy air) suggests that the speakers: "will operate adequately with an amplifier or receiver of 70–100 watts", before going on to recommend 100–500 watts to "ensure optimal system performance". In my experience, although the most powerful amplifiers are also usually the most expensive, they only rarely offer the best sound. Clearly the single-ended triode valve amplifier doesn't figure on JBL's radar, but i spent many delightful hours enjoying the Everests with a pair of three watt rated PX-4-based monoblocks, via a passive Music first pre-amplifier. Simplicity has its advantages. While this is certainly a speaker for those who like to play their music loud, the Everest is also beautifully smooth and delicate at low and very low levels. Despite the undoubted qualities of my regular PMC's iB2i references, the JBL DD66000 does indeed go a long way towards justifying its much higher price and actually seems rather good value by high-end speaker standards.